This time around, President Barack Obama’s message can sound decidedly down-to-earth. Four years after winning the White House, Obama is dealing with a different economic and political reality as he seeks re-election. He’s focused less on a lofty vision for overcoming divisions and remaking Washington, and more on the most basic building blocks of middle-class economic security: a job, a house, a college education for the kids, health care, money for retirement. What Obama describes as the American Dream can seem a spare, fundamental aspiration, tailored for a campaign that looks to be fought over who is best equipped to safeguard the interests of middle-class Americans. In the public education system, the United States spends over $10,000 per pupil per year. Where does it all go? I don’t know, but based on some of these responses, it’s easy to see where it doesn’t go. Bush often got slammed for the amount of time he spent in Crawford, Texas, but at least that was at his own house and the amount of taxpayer expense was kept to a minimum as a result. Also, Bush never went on vacations after calling for “shared sacrifice” from the rest of us peons. Also, imagine if Laura Bush had been staying at five-star resorts around the world on the taxpayer dime without the president there. Now imagine Laura did so not long after telling Americans they might have to give up some of their pie so others can have more. The mockery and criticism of FLOTUS & POTUS when it comes to these trips isn’t about politics or what past presidents’ families have done as far as time away from the White House — it’s about the optics and hypocrisy of the Obamas’ words vs. their actions. Following the passage of the payroll tax cut and unemployment benefits extension, Democratic Michigan Rep. John Conyers, the ranking member on the Judiciary Committee, explained to The Daily Caller how he had not read the legislation prior to voting for it. Conyers was asked by TheDC why he supported the legislation when the payroll tax cut portion of the bill was not funded by spending cuts. “Well, I could vote yes or I could vote no. I voted yes because I didn’t want a payroll tax to be restored on working people and besides I wanted the doc fix in there too,” Conyers told TheDC on Capitol Hill Friday. TheDC also asked Conyers if he read the bill before voting for it. “I did not read the bill before it was voted on. I’ve been following it for about 8 months,” he said. But guess what Conyers does have time to read. The story (video below) cites rising auto sales, the Dow approaching 13,000, and huge GM profits (watch the GM profit announcement here). Conveniently avoided is the sharp drop in the number of working Americans. Food stamp use continues to be at a record high. Unemployment remains well over 8 percent even with the administration massaging the numbers. On top of it all, debt continues to soar and deficits aren’t decreasing, as they were laughably projected to do. The fact is, during the Bush Adm., the Dow Jones was over 13,000 from April 2007 to January 2008, hitting an all-time high of 14,164 on October 9th, 2007. At that same time, the unemployment rate was 4.7% according to the Bureau of Labor Statistics and the same liberal media tried to convince us we were in a depression. I’m shocked they didn’t offer the Obama spin on high gas prices: That it’s a sign the economy is bouncing back. ABC must have missed that memo, but the talking point might find its way into their next story about the economy’s amazing comeback. Has it been three glorious and prosperous years already? It seems like only yesterday the “Reinvestment and Recovery Act” was a gleam in Sheriff Joe Biden’s eye. Impressive, huh? But come on, what do you expect for only a trillion dollars? The percentage of Americans in the work force has declined, so those people who have given up looking for work don’t count towards the unemployment rate (if you count them as well as people working part time who would rather work full time, the real unemployment rate is 15%, according to the CBO). 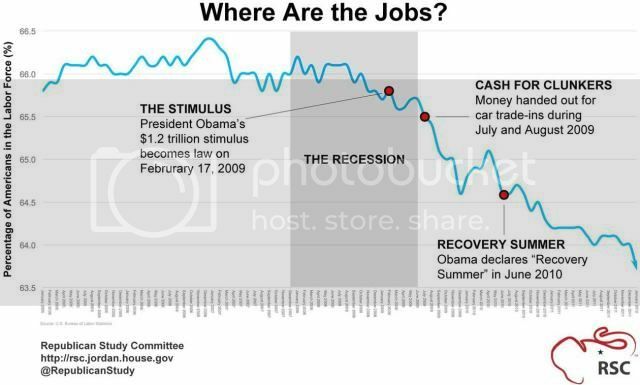 That allows Team Obama to present the illusion that the economy is actually turning the corner. But if that were indeed the case, people would be entering the workforce, not exiting it. People who have given up looking for work not being counted as “unemployed” means that the only practical way to get the unemployment rate to zero would be for all Americans to lose their jobs and not look for another. People who have given up looking for work should be counted in the unemployment stats, if for no other reason than to take away some self-serving politician’s incentive to make sure they stay that way. The Rev. Al Sharpton tried to move heaven and earth yesterday to keep his SUV from being towed at La Guardia Airport — but no amount of preaching could stop Port Authority cops from impounding the vehicle. An officer rolled up on the 2008 Lincoln Navigator at around 2 p.m. outside the Delta and US Airways terminal as the MSNBC host’s driver waited to pick him up in a clearly marked “no standing” zone, said PA Police spokesman Al Della Fave. PAPD cop Oscar Ruiz asked the driver for his paperwork and quickly discovered that the SUV had a suspended registration “due to lack of insurance,” the spokesman said. At that point, Sharpton emerged from the terminal after a flight from Washington, DC, and raised holy hell over the situation. “He begins yelling, saying the cop was just doing this because of who he was,” a source said. But the driver ignored his boss and turned over the keys to the cop — who issued the vehicle three summonses for illegal parking, lack of insurance and suspended registration. So it’s confirmed… Al Sharpton is not buying auto insurance with the the money he saves not paying back taxes.